Warren Buffett broke his months-long silence on the Wells Fargo fake account scandal by saying the bank made a "terrible mistake" by keeping in place sales goals that "corrupted people." "It was a dumb incentive system," Buffett told CNN's Poppy Harlow. The legendary investor said "incentives have terrific power" and that Wells Fargo (WFC) created a system that "produced bad behavior." However, Buffett said he has not sold a single share of the bank since Wells Fargo admitted in September to creating as many as 2 million fake accounts and firing 5,300 of its workers related to the scandal. Berkshire Hathaway is Wells Fargo's biggest shareholder and Buffett personally owns 2 million shares. Buffett said he continues to have faith in Wells Fargo as an "incredible institution." It was Buffett's first public comments on Wells Fargo since the fake account scandal rocked the bank. In the weeks since the news first broke, Wells Fargo's name has been dragged through the mud. The bank's CEO was humiliated and taunted on the floor of both the House and Senate. Members of Congress called Wells Fargo a "criminal enterprise" and Senator Elizabeth Warren's epic takedown of the CEO went viral. Within days, CEO John Stumpf resigned in disgrace. And the bank is being investigated by the Department of Justice and multiple federal, state and local agencies. Wells Fargo has since abandoned the unrealistic sales goals that employees blame for the millions of fake accounts. The blind pursuit of these goals led to a "toxic" culture that employees said was rife with bullying, intimidation and even retaliation against whistleblowers. Asked why he's sticking with Wells Fargo despite the controversy swirling around the bank, Buffett said he's sure this is not the only company he's invested in that has problems. "It's not my job to run those companies," he said. One of the reasons why there's been so much speculation over whether Buffett would continue to hold on to his Wells Fargo stock was the famous comments Buffett made 25 years ago to Congress. At that time there was a scandal rocking Salomon Brothers, an investment bank Berkshire had invested in, and Buffett was on the board of directors at Salomon. "Lose money for my firm and I will be understanding; lose a shred of reputation for the firm, and I will be ruthless," Buffett testified before Congress in 1991. Buffett was already an investing legend by then, but comments like this sealed his own reputation as an investor with values and integrity. This time, Buffett is sticking by Wells Fargo. That doesn't mean he's shied away from criticizing the response by Wells Fargo and its former CEO. Buffett described Stumpf as a "very decent man" who "made a hell of a mistake." But Buffett learned of the scandal only after he read media reports. After seeing Stumpf downplay the situation during a CNBC interview in September, Buffett called him. "I said, 'I don't think you've gotten the gravity of the situation.'" Asked if he felt misled by Stumpf, Buffett said that he didn't. "I feel he made a hell of a mistake...and he didn't correct it," Buffett said. Buffett said he didn't want to draw too much of a parallel between Stumpf's inaction and that of John Gutfreund who was the CEO of Salomon during its scandal. "John Gutfreund didn't commit the act of Solomon that caused the problem, He sucked his thumb...when he learned about it," Buffett said. "And then it mushroomed, as problems do, out of control. And then, being behind the curve, he didn't know what to do exactly." Buffett said he did not tell Stumpf to step down. That's because he's not technically allowed to do so. Buffett had agreed to become a "passive" investor in Wells Fargo as part of an agreement with the Federal Reserve when Berkshire boosted its stake to 10%, or 490 million shares. Of course, Buffett did speak with Stumpf, who was chairman of the board at the time. Buffett disagreed with critics who think Wells Fargo should have hired an outsider for the top job instead of Tim Sloan, a 29-year veteran of the bank, who replaced Stumpf. 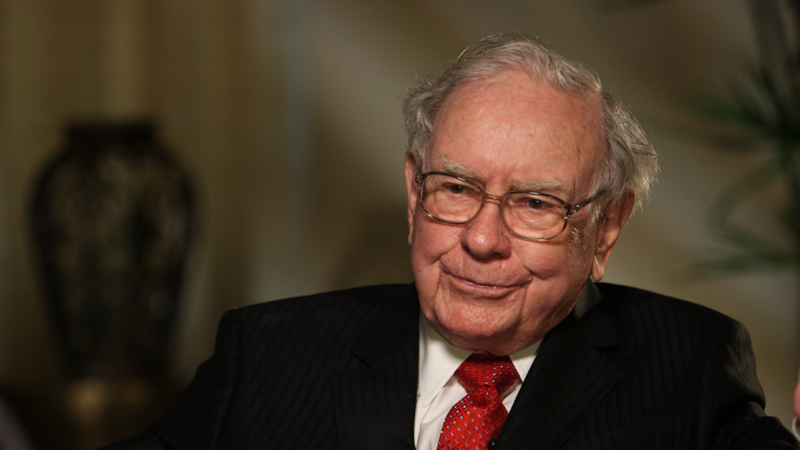 "I think Tim Sloan's exactly right," Buffett said, adding that the two met in Omaha over lunch. However, Buffett acknowledged Sloan has his job cut out for him. "It takes time to restore trust," Buffett said.